Clients were wanting an 'outdoor living room' extension to their house where they could entertain friends and family. 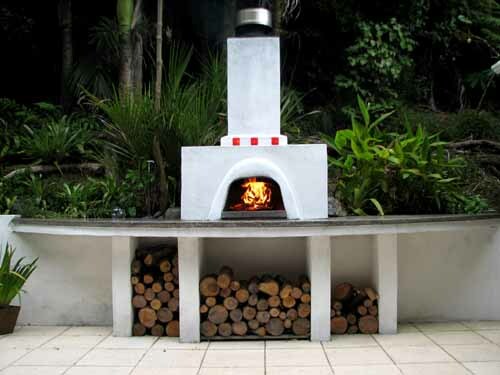 They also wanted a wood-fired pizza oven with large bench space areas. An outdoor courtyard area was created from scratch. The area was levelled and pavers were laid. Chest height courtyard walls were constructed that also acted as retaining walls to the surrounding banks. A large curved, feature bench area was created out of polished concrete with the wood-fired pizza oven positioned in the middle and firewood compartments underneath. A medley of native shrubs and bromeliads were planted in cascading waves on the surrounding bank area.